If you've been having trouble overclocking your GeForce GTX 1070 graphics card, you're not alone. Several users have complained of less-than-expected overclocking headroom, and apparently the issue has to do with cards using Micron VRAM. 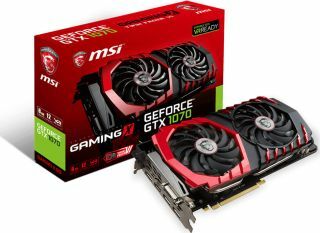 Nvidia's hardware partners have been releasing BIOS updates to address the issue, including MSI, which released an update over the weekend for its GeForce GTX 1070 Gaming X 8G graphics card. Not all GeForce GTX 1070 graphics cards are affected by this. Originally manufacturers used Samsung memory modules on their GeForce GTX 1070 graphics cards, ones that could reach 8,000MHz effective memory speeds with relative ease. However, high demand and a shortage of chips caused manufacturers to source memory modules from Micron as well, and apparently those are the ones causing problems, according to PCGamesN. There are reports on various forums of not just overclocking issues, but also artifacts and graphical anomalies when running affected cards at factory settings, even when those factory settings stick with Nvidia's reference 8,000MHz frequency. This is not something that can be fixed with a driver update, though Nvidia still got involved with a BIOS tweak that it shared with its board partners. "We have implemented a change to our video BIOS which should improve the overclocking experience for certain users. The updated video BIOS should be available through our add-in board partners at a later date," Nvidia stated on its GeForce forum back in late September. Since then Nvidia's board partners have been releasing BIOS updates, the newest of which is MSI. If you're affected by the issue, you can download the updated BIOS here, just note that this is specific to the GeForce GTX 1070 Gaming X 8G graphics card and not other GeForce GTX 1070 models. The folks at Guru3D have been keeping a running list of available BIOS updates and links. At present, you can also find BIOS updates for Asus (here), EVGA (here), Gainward (here), Gigabyte (here—beta), and Palit (here) brand GeForce GTX 1070 cards. To check what brand video memory your card has, download and run GPU-Z. About midway down is a field titled Memory Type that will either say "GDDR5 (Samsung)" or "GDDR5 (Micron)."